I still have unshared photos from my visit to the Lone Fir Cemetery two weekends ago, and I better get to posting them, because autumn is practically a thing of the past! This is the largest mausoleum at Lone Fir, built here by Portland merchant and banker Donald Macleay in 1877 after his wife, Martha, died in childbirth. 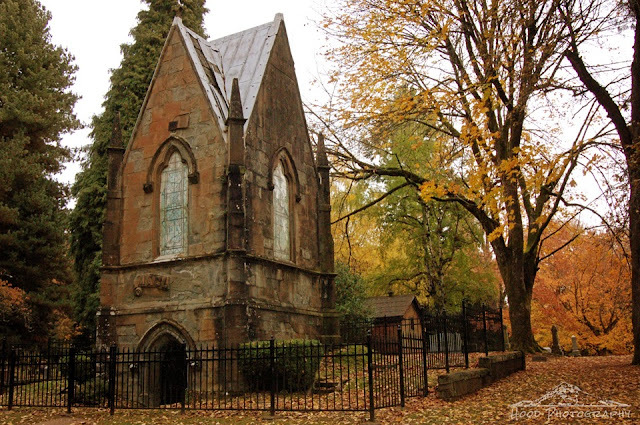 The two story building is also the tallest in the cemetery, with the first story being the burial crypt and the second story featuring a chapel. Gorgeous photo. I love cemeteries and the history behind them. Gee, that's quite a memorial - well deserving of the name sepulcher. Wow, quite the building. Boom & Gary of the Vermilon River, Canada. wow what a tribute to his beloved wife... it is beautiful! Such a peaceful location for this, just beautiful! That is awesome, especially with the autumn leaves all around. An absolutely beautiful photo--I LOVE historic cemeteries! It looks rather formidable, but not overstated. An excellent pic. What an amazing building and the colours of the leaves are lovely.